morning....... I thought I'd share my altered Bird Cage with you. It was one of the Come Away with Me samples off the G45 shows on C & C TV. I've had the template for quite a while and not used it, maybe I was waiting for the right project to come along, although there's no bird in this cage. The template is from the House of Zandra, and to give the finished piece more strength I stuck the paper to card stock before cutting out the pieces. and then fussy cut out the images for the inside from 12 x 12 papers. You do need a steady hand, a sharp knife, a craft mat and some patience for this one if you're thinking of making it. The video below gives a better view of the whole project. On my way back from Peterborough I called in on Isobel at Scotch Lodge Farm and she's now got the cage in her craft shop. Well thats all from me today, off to buy a gorgeous coat I saw yesterday If its still in the shop. Have a great day to, thanks for calling by and catch up again soon. Love the cage! I do hope you get the coat too - it's horrible if you go back and it's gone, I've done that in the past. Morning Clare, Loving this altered bird cage, will watch video later. Just having a quick coffee in between my 'clean all' Thursday haha. I hope you manage to get the coat. Hi Clare I did comment the other day on this, guess it got lost in "cyber space" somewhere!! Anyway, love the birdcage, am still frantically working on my photo mats for the steampunk album. almost done. Am recouping from the oral surgery so I get tired but I'll make it, ha, ha. 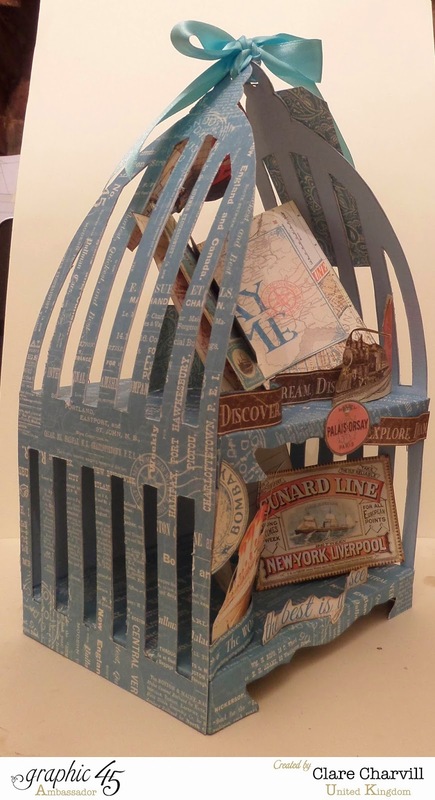 Good afternoon Clare, Your altered bird cage looks absolutely fabulous and I am really looking forward to watching your video a little later. I do hope your shopping spree was successful and that you were able to get the coat you were looking for. I guess it's that time of year again when we all start to think about switching to or renewing our winter wardrobe. I now I need a new coat too but I dread the thought of having to look for one. It seems all the ones I like are either too small or touch the ground! Thanks for sharing your latest project and I hope you enjoy the rest of your day. Take care.